Summertime food staples: fresh and light seafood dishes and sticky sno cones. Am I right? Since our summer has been super busy and not as much beachy, I had a yearning for these two classic beach meals even though I haven't seen the beach, let alone a pool raft, for weeks on end this year. Thankfully I've found two coastal ex pats residing in Dallas for myself and the rest of us that can't escape to the waters, no matter how the tides try to pull us out. 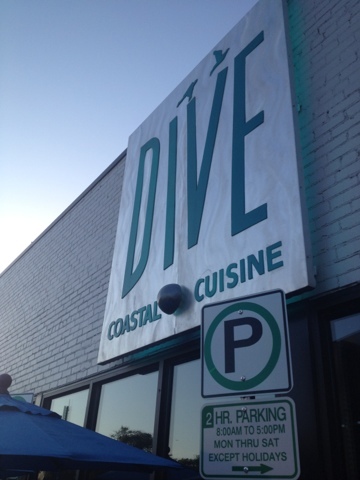 Your perfect "almost like being on vacation" Dallas dining experience is Dive Coastal Cuisine in Snider Plaza. Even the curb appeal will have you thinking that you need to wipe your sandy feet before heading inside. After our recent bathroom renovation you might be familiar with my opinions on spaces that try to hard for a thematic look instead of just focusing on small details that capture the essence of a theme. I get especially riled up about this when it comes to beach/nautical themes. I think it has to do with years of staring at seashell soaps on my grandmother's vanity that I wasn't allowed to use or make questions about. Questions like: Why do you have soap that you cant use? Wouldn't the soap just turn into bubbles and melt away if you actually put it in the ocean where a seashell belongs? I think I've gotten off topic. But what I was saying is, Dive made me feel like I was in a great spot out of town. It was a feeling brought on by many smaller elements harmonizing together to write a beachy symphony for the senses, not a print of the ocean on the wall or fishing net hanging for the ceiling. 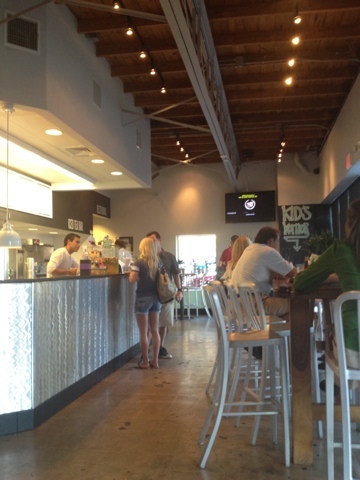 This is Highland Park people, not a crab shack off of Beltline. *a common acronym, shortening the less societally appropriate phrase "Freak the F*ck Out"
If you prefer your bars to carry more adult beverages, Dive has that as well. While I was there they were actually in the process of switching from a beer and wine license to a full liquor license so patrons got one beer or glass of wine for free with their meal. 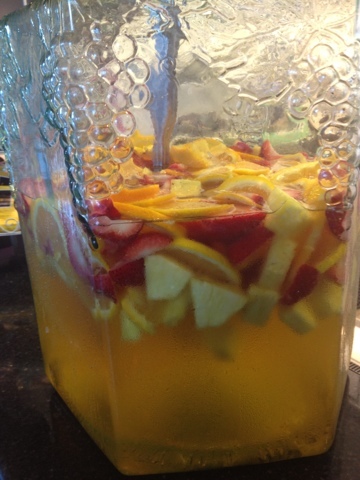 Doesn't this Sangria look amazing? It's tempting to drink the whole thing. But for the love of Randy Travis, please keep it to one glass. 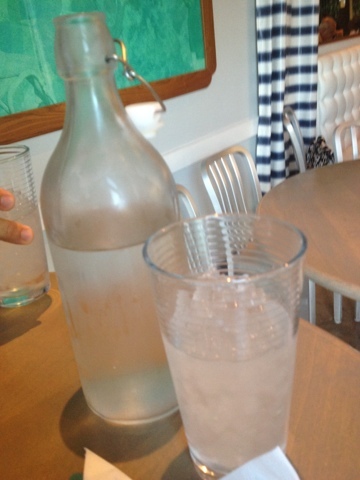 Of course the most adult beverage is the chilled filtered water that they bring to your table. 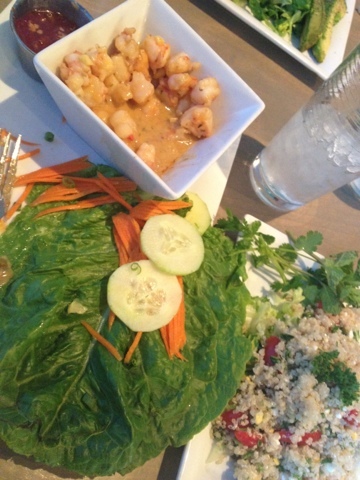 I had the shrimp lettuce wraps (usually served as an appetizer) and the quinoa salad for my dinner. The lettuce wraps were very good. Great quality rock shrimp tossed in a peanut sauce. The lettuce and veggies were exeptionally fresh and there is a chili oil served on the side to spice up your self made spring roll. The quinoa salad was also a blend of superior quality ingredients. The goat cheese had a great flavor! This is a cold salad and comes straight out of the refrigerator, so it was a little weird at times going from a warm shrimp dish to a forkful of cold quinoa, but both dishes were filling and delicious! 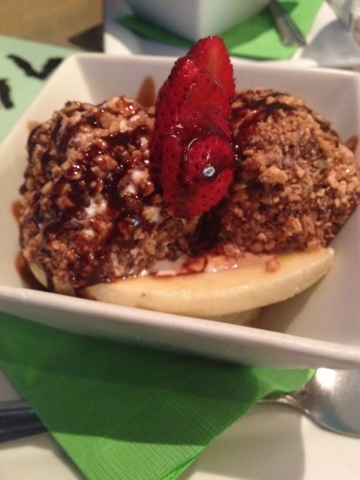 Then there was, of course, the Heath Bar banana split. What you see below is a half portion of this incredible dessert, since the restaurant staff thought I might want to split my dessert order with Markus. Both the staff and Markus can dream on. A perfectly ripened strawberry sits atop two scoops on ice cream - one chocolate and one a true vanilla (visible flecks of vanilla bean and all) - rolled in Heath bar topping. These glorious mounds are on a banana, sliced down the middle and a dollop of whipped cream. Whipped cream on the BOTTOM of a banana split. So that your spoon is not all consumed with the whipped cream before it can pick up any other flavors on the way to your mouth, like we see so often in the world of conventional banana splits. Of all the delicious, gluten free items that Dive offers, I think this is the one that will be calling me back soon. My next summer food adventure took me a little more off the beaten path. 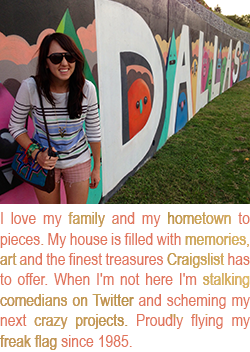 Saturday I had a hankering that hit me like a freigh train. 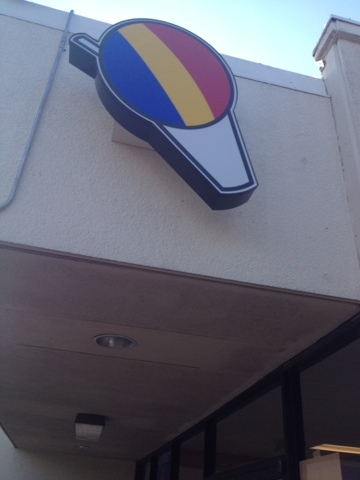 I needed a sno cone and I needed one twenty minutes ago. The shaved ice truck in Dallas can be inconsistent with their available flavors, and I happen to snoot my nose up at sno cone flavors like one of, say, actually refined tastes might at wines or chocolate. If you don't gots my flavor then I gotsta go! 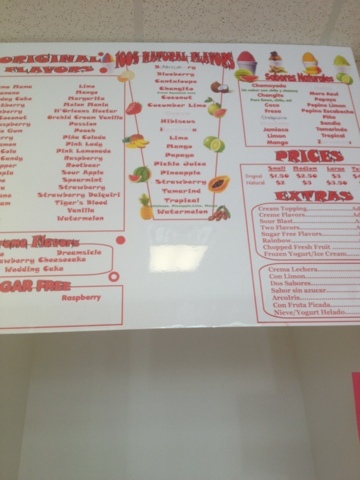 After Markus refused to drive to the sno cone shop in Garland it was find a new place for my fix or go without. God blessed the broken road that led me straight to this sign. Sno is next to Doc's Food Store on Meadow Rd and it is a little bit of Heaven in a strip mall off Central Expressway. 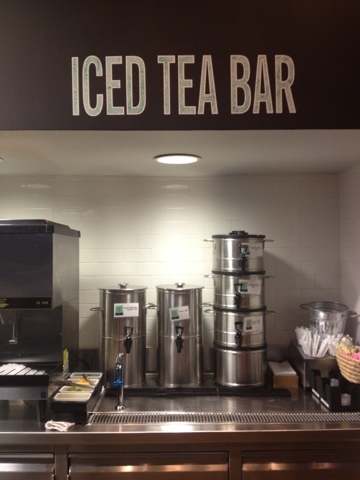 There were flavors for miles. The ones that caught my eye were labeled "100% Natural." Um, 100% natural what? Natural sugar and pink food coloring? Then I saw the fruit in the corner of the prep station being pureed into syrups to top the sno cones and I proceeded to F.T.F.O. There were some crazy creations coming off the counter as I wait in line. Sno treats made with pickle juice, japanese peanuts and chili sauce - sometimes all together! If you're adventurous when it comes to your frozen goods I definitely think it would be worth your while to ask the pony tail guy working the prep line what his recommendation would be. Everything about the pony tail guy pointed to him knowing what's up. 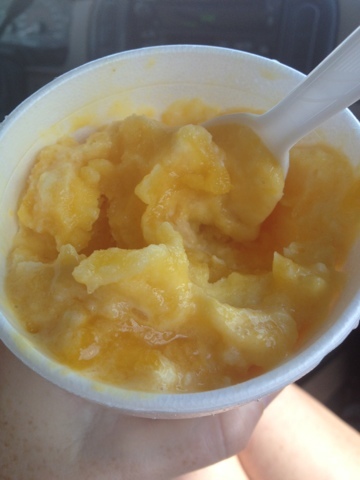 I got my sno cone made with a natural mango puree and cream. I honestly do not think I can eat a regular sno cone ever again! You know how the first 5-10 bites of a sno cone are usually the best and then by the end it is so sugary that your teeth feel furry and your vision is going in and out? 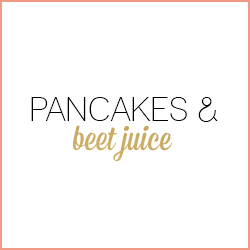 Not the case when the syrup is a fruit puree my friends. I felt good, I felt great, I felt wonderful. I've always added some cream to balance the syrup in a sno cone and I honestly don't think I needed it here. A Southerner blogging about how a dish might not have needed heavy cream - it's a blogging miracle! What I will add next time is a dusting of the chili lime power that they keep on the counter. Next time being tomorrow when it will be time again to eat this glorious treat. What foods scream summer to you? Is there a food that you love to get on vacation that is hard to replicate when you're at home?